Sales Tools in 2017 - it's different! Every year it seems like the same exercise. The holidays approach, winter sets in, we spend time with family and friends, and we start to think about how next year is going to be better (or at least - different). Different is not always better, but when you try things differently, you may get a different result. Different is a start. Different will always be a good experience for you because it will either affirm that the current way you do things is still great, or it will show you a new pathway to even greater success. If you're unhappy with how things are right now, the exercise is critical. Change now, do something different, or be stuck with your unhappiness. This begs the question: How do we change things? Whether it is your professional sales career or something more personal (like getting more exercise or eating cleaner), the experts will tell you that you need to plan for your success. Actually you need at least four things: 1) Define what you are currently doing; 2) Accept how you are feeling about it; 3) Agree upon an objective goal that you can measure; 4) Create a plan - with milestones - that is reasonable and achievable. All of this is difficult to do in your head, and there is a mountain of scientific evidence that demonstrates that you will see significantly better results if you do this on paper ("on paper" today includes things like on a computer, on an iPad, using a tool, etc.). Before the age of constant connectivity, science would still insist that you physically write this down. Even today, productivity experts still suggest that your brain knows the difference between handwriting and typing. There is a physical/mental connection between the hand-motions of writing versus typing (weird, right). Given so many ways to take notes, set reminders, be alerted, email/text/instant message, etc. what should we be doing today, in 2017, to be most effective at instituting change in our work and personal lives? How do we structure and use tools differently than we might have done in the past (even as recently as last year)? Here's some ideas that should get you thinking about self-improvement. The most important take-away is to begin somewhere. Don't wait. Don't think about how to do it perfectly, just get the four items above written down somewhere and read it the next day. Then do a bit more. Read the items every day. Planners and Notebooks. Still the king. Doesn't require electricity, a charger, a reminder, or an internet connection. Still has the most scientific evidence of being your best tool out there. Still produced in enormous quantities, but things have changed for the planner you used a few years ago. Today, planners have crossed the Millennial line, and are being manufactured by small start-up companies hoping to get you just a little more productive. Planners like Passion Planner and Panda Planner have sold millions of units aimed at integrating journaling (which is another time-tested way to implement change) and productivity planning. While traditional planners like Franklin Covey and Day Timer have focused on prioritizing tasks and time, today's more flexible planners (neatly bound in a flexible, rubber-banded package) push users towards creativity and "infinite possibilities"). I've found these new planners to do everything the older-style planners did, and more. They actually pushed me to write more things down, document the wins, focus on positive thinking and track patterns at-a-glance. 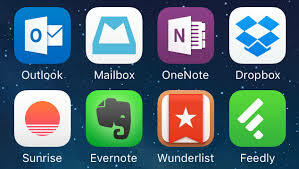 OneNote, EverNote, AnyNote. Regardless of the name, these constantly connected, cloud-based note-taking applications are slick and enable mobility without carrying around a planner. But wait. Don't you have to then carry-around a device that's good for typing or hand-writing? Now you have to start thinking about how good your note taking/reading is on an iPhone, iPad, or laptop. You have to start worrying about connectivity and synchronization. You also have to think about battery use and accessories. Unless you are somebody who simply sits in front of a computer for 16 hours a day (even on weekends), there's something here that just requires more effort and, thus, less productivity. Isn't the whole thing supposed to give you more productivity? Isn't it interesting that Microsoft OneNote goes to great lengths to mimic a real notebook, with tabs, pages and more? The big advantage of using these online, connected SAAS products is that you can copy metadata, links and photos directly into the tool. This is way more productive than printing, cutting, pasting and 3-hole punching your way into a planner. It's a trade-off. Sometimes the easiest thing is not the best thing. Maybe there are two things going on at the same time (the need for productivity management and the convenience of photos, artwork, and web links at your fingertips). What will really bend your noodle is tools like the Microsoft Surface, which create a very realistic digital writing experience in OneNote, and perform pretty good optical character recognition. Hmmm, the debate will go on and as a society, we will spend a lot of money and time figuring this out. Post-It Notes, Sticky Notes, Outlook Tasks and Reminders. Productivity experts will frown on using these throw-away tools. They will tell you that you are decreasing your productivity by using a second tool to do something that should be all in one place. This is as true today as it way ten years ago. If you are keeping all of your priorities, tasks, reminders and data in a single tool, why distract yourself in this way? Sticky notes and card systems are similar to email flags. In order to see the flags, you have to read through everything, or create a separate view to see all your flags. It seems good at the time, but all of these things actually diminish your productivity. If you have a desk full of files, documents, sticky notes, notebooks and cards - this is a sign of disorganization and big-time loss of productivity. Stop and make some decisions to streamline your work life. Regardless of the tool, think about change. What do you really want in 2017? How will you do things differently? What are the four items required for change in your situation? While I am typing this blog on the computer, I only composed this because my planner helped me to prioritize and reflect on the importance and reasons behind it. Perspective is sometimes the thing we need to change most.